Features: Strong and sturdy coil-beam construction enhance durability. 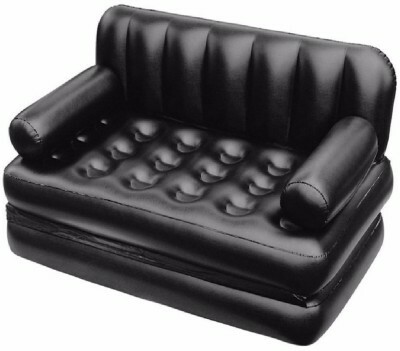 The surface of the blow up sofa bed is also flocked, providing sensational comfort when sitting or snoozing. It can be effortlessly unfolded to form a snug double bed. Can be use as double couch or double bed. Perfect for putting up visitors. Descriptions: Come with air pump for quick and easy inflation, can be inflated in 4 1/2 minutes. It is a stylish and practical seating solution for the modern home. Safety valves for no leakage. Specifications: Material: PVC Folded: 152x94x86cm Unfolded: 64x152x188cm Color: black Package included: 1 x Inflatable Sofa 1 x Bag 1 x Pump Notes: 1.Due to the difference between different monitors,the picture may not reflect the actual color of the item. 2.Due to the manual measurement and different measurement methods, please allow 1-3cm deviation. (NOTE-10 days Replacement policy (if damage) only Buy from KPEARL Thanks!